A Wide range of latching relay products from Industrial Spacetek (ISTEK) are available for customers to choose. These bistable relays have been designed and manufactured to meet different power management requirements. They have very high performances on functions like connect and disconnect of power supplies; tariff and prepayment of energy meters. Depending on the operational ambient conditions and the load of the controlled circuit, clients can select the most suitable latching relays from our broad range of products. While most of our bistable relay products are single phase latching relays, we also have multi-pole relays including three phase latching power relay products. 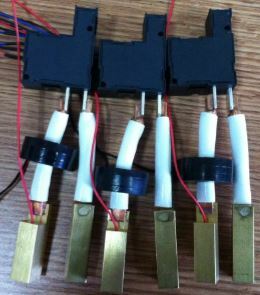 Customised relay assemblies with copper wires, brass terminals, CTs and shunts are also available when required. 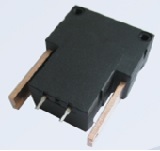 Majority of our magnetic latching relays can come with either one or two coils. The rated coil voltage spans from 5vdc to 48vdc including the most popular choices of 12vdc and 24vdc. In general, our bistable relays are divided into three categories based on their switching power and contact capacity. Contact Resistance at Rated Current: 0.5mΩ Max. Dielectric Strength: between contacts - 1,500Vac (50/60Hz 1min); between contact and coil - 4,000Vac (50/60Hz 1min). Dielectric Strength: between contacts - 2,000Vac (50/60Hz 1min); between contact and coil - 4,000Vac (50/60Hz 1min). Applications: smart metering (power meter), electrical remote control, energy compound switch (SCR combined switch), energy leakage protection etc..
HTLW-R111-100A: very compact size with internal magnetic protection shield, this uniquely designed latching relay stands out in the market for its superior anti-magnetic-tampering performance. Contact us for more details or trial samples. Contact Resistance at Rated Current: 0.4mΩ Max. Contact us to find out the competitive price and other customization options for this outstanding relay. Contact us to find out the best price or more technical details of this relay. Contact Resistance at Rated Current: 0.3mΩ Max. Contact us to find out the lowest price from us or more technical details for this high contact rating relay.